A view of the contraflow system which will be in place from next week. Demolition of a bridge which carries the A90 dual carriageway at Stonehaven will begin on Monday (April 3). Between Monday April 3 and Friday April 7, the bridge will be cut in to two sections, separating the northbound and southbound carriageways. These works will assist with the demolition of the southbound carriageway. 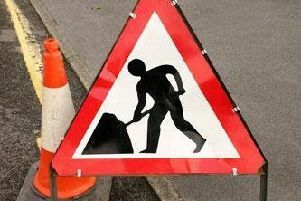 For safety reasons, the B979 between New Mains of Ury and Glenury Road will close from 8pm until 6am each night to allow these works to take place. On Friday April 7, this road is again planned to be closed from 8pm until 6am on Monday April 10, it is anticipated that the southbound A90 carriageway will be demolished using specialist plant including breakers. Reconstruction works will then begin. Diversions will be signposted and road users heading north from Stonehaven are being advised to travel via B979 David Street, Allardice Street and then the A957 Bridgefield, Dunnottar Avenue up to Glasslaw junction. They should then turn right onto the A92, known locally as the Coast Road (Dunfermline to Stonehaven Road), which leads to the A90. Road users heading south into Stonehaven should travel via the B979 New Mains of Ury before turning left to join the A90 heading north towards Aberdeen. They should then leave the A90 at the Newtonhill flyover junction and re-join the A90 heading south, taking the first exit to Stonehaven, the U90K Den of Logie Road. A contraflow, which has been in place on the A90 since March, will remain in place while these works are underway. The existing A90 northbound slip roads will also remain open throughout the works but will be subject to speed restrictions, local realignments and occasional overnight temporary traffic lights. A Transport Scotland spokesperson said: “These essential demolition works at Stonehaven have been planned to take place when roads are quieter to minimise inconvenience to road users. “The traffic management measures in place will enable part of the bridge carrying the A90 over the B979 to be demolished and then reconstructed safely. Once the bridge has been re-built and works are complete, the contraflow currently on the northbound carriageway will move to the new southbound carriageway to allow the remainder of the existing bridge to be demolished and reconstructed. “The works at Stonehaven will also involve widening the B979 Netherley Road; the construction of new slips roads to and from the A90; and the creation of a new roundabout, which will form the junction between the AWPR, the A90 and the B979. “These demolition works are taking place in close proximity to the A90 northbound carriageway, which will remain open. We would like to remind them to apply more caution than usual when driving near these works. A meeting has been organised by Stonehaven and District community council to meet with AWPR representatives at the Invercarron Resource Centre on Tuesday April 11 at 7.30pm, members of the public are welcome to attend.